This weekend, "What Bombs at Midnight" stepped into our first mythic level dungeons. We did remarkably well on each of them, which really surprised us due to our gear score at start was an average i-level of 830. With the intention of Karazhan attunement, we started with Khadgar's quest the [Edict of the God-King]. Edict has you run Halls of Valor on mythic difficulty. As we've found out, mythic (or as those leet players would like to call, mythic+0), is not that different than a heroic dungeon. As their 6 of us, we had to run the dungeon two times, swapping out DPS. Our first attempt on included 4 wipes on Hymdall due to learning the dragon-flame mechanic, and 6 wipes on Odyn to learn the stormforged obliterator mechanic. The Day 2 run of Halls of Valor ended early (and 4 of us got no loot from the bosses), we decided to go through and run one of the three dungeons for part 2, [Uncovering Orders]. Being efficient, as we were already in Dalaran, we went into Violet Hold. The trash was rather straight-forward, nothing notable. The only noticable difference being they spawn a lot closer, causing some overlap with groups. One or two groups ran down while we were still cleaning up the previous. Because of this, I found it easier to tank everything on the 'floor' and not run up to the trash. The bosses appeared to be in 'heroic' form, nothing really special. Festerface - wiped about 3 times on this boss until I got the 'drag him to the nasty pools' mechanic down. On last attempt, I died to splash damage from the corrupted pools, but DarkFiber rogue tanked him. Mindflayer Kaahrj- IIRC, we one-shotted him. Tank role: Don't stand in garbage. Interrupt spells. We'd call these out "used mine" and spread these out amongst the party. Malgath - also a one-shot - maybe two. Pickup trash and avoid stuff on ground. Fel-Lord Betrug - Lucky, it appears to be the easier of the two options for last boss. Face him away from party, actively mitigate his big hits. We almost let DarkFiber die to the Execution event. Since, it was only a little after midnight, heads filled with optimism, we figured heck, why-not, run ONE MORE! Ah, Vault of Wardens. Top it off, it has a World Quest night (for easy solution see DaveRuiz comment). Noteable bosses..
Tirathon Saltheril - Just watch out for the chain. Got caught fighting boss then chain chopped me in half. Inquisitor Tormentorum - Inquisitive Stare mechanic. Requires you to be facing the 'orb' when it starts casting it's stare. If you're facing away, it will stun you. So I ended up run up to boss, and tanking his adds with my back against the cell wall. This way I could turn to face orb and still have adds. Cordana Felsong - sigh, died so many times, I must be running this fight naked? This fight is super heavy RNG dependent. She has a phase, every 20% health drop, were she summons ranks of legions that cross the room. These are 'only visible' when the player carrying the 'elunes light' shines on them. The one thing that we started to recognize was the arrow pattern. We could all start lining up and running to this spot. In mythic, you need to do this maze, 4 times in a row. So RNG may have the opening of one, edge up to the start of the second.. Bad timing and you're bounced off, over or just killed all together. Of course, the damage is AOE, so getting hit by them will usually cause a wipe. We did find, that jumping off the edge of the platform will sometimes reset the fight. This saved on repair bills when it was just DPS left alive up there..
As Rys wasn't feeling well, well have to run those two dungeons again with her. Having to face Cordana's RNG is dreadful. Next up, Black Rook Hold. Hmm 2 prisons and a fortress. Reading through the strat guide, I don't think it will kill us. Most of the additional mythic items aren't (sounding) that more difficult. (Of course, Cordana's strat guide doesn't reflect how difficult the 4 ranks of legion are.. 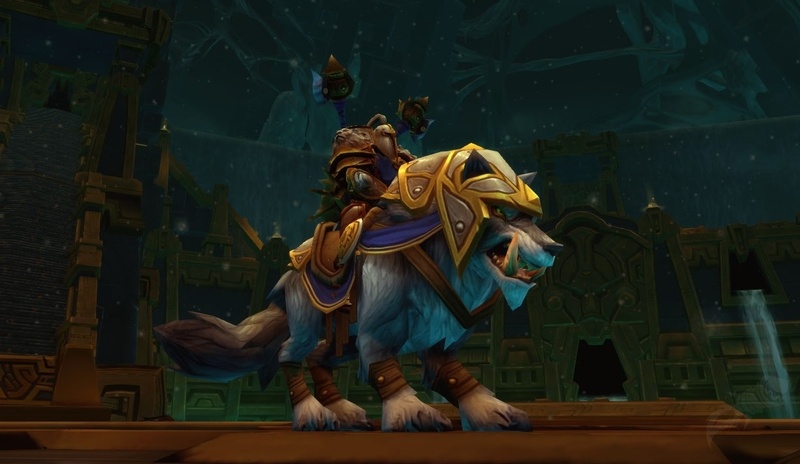 Team is anxious to run them early this week, with hopes to running Karazhan by the weekend. Overall, mythic dungeons have been a fun addition and everyone is happy. Game play has added enough difficult, that we just can't plow through the trash to the boss. We need to plan, CC and even pull rather slowly. It's obvious now why the 'same-server' requirement is there. This isn't something you can plow through without good communication. Missing an interrupt is forgivable in normal and heroic, but at our gear level, it's deadly.